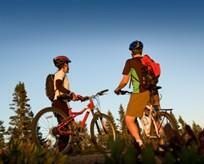 Mountain Biking: A Great Adventure Travel Option! Adventure travel is replacing the traditional tour bus type of world travel, and deals on adventure travel can be found if you know where to look. Whether you're interested in a wine-tasting adventure, a mountain biking trek, or one of hundreds of other adventures, such trips are fun, memorable, and come in all price ranges. Adventure travel is a broad term that describes any sort of travel that centers around an activity. The type of activity is only limited by your imagination and your abilities. It might be cooking in Tuscany, cycling along Holland's canals, diving in Palau, or fly-fishing in New Zealand. Because adventure travel often involves special equipment and advance guides and access, it is a little trickier to book than traditional travel. Below are just some of the many types of adventure travel. Fishing Vacations - Fishing adventures can be anything from a day charter to a week-long visit to a lodge only accessible via air. Some of the popular fishing adventure travel destinations include New Zealand, the US Great Lakes, Cuba and the Florida Keys, and Cabo San Lucas. Cycling Adventures - Available for all skill levels, these trips include cycling through Provence, biking in China, and cycling through Mexico. Hiking Treks - Wherever there are hills and scenic valleys, you'll find hiking adventures. Many operators offer trips for beginning, intermediate, and advanced hikers and transport your gear for you to the next stop. Other Adventure Options - Adventure travel experiences are limited mostly by your imagination. Other popular trips include diving and snorkeling trips, horseback riding treks, week-long stays at dude ranches, and trips that combine helping others, with such projects as home-building for Habitat for Humanity. Specialty Travel Index - One of the best places to search for adventure travel operators is in a reference book called the Specialty Travel Index. Most libraries and travel agencies stock this book or it can be ordered online. This publication lists over 500 operators, with packages from culinary tours to camel treks to dive adventures along the Great Barrier Reef. Adventure Travel Agents - A travel agent who specializes in the type of adventure travel that interests you can be an invaluable asset. Because he deals with travel on a daily basis, he can spot a new package or a good price for the destination in which you're interested as soon as it becomes available. A good adventure travel agent can also put you in touch with travelers who have just returned from your destination. Book Early - Always a good travel practice, but especially important in adventure travel when spots and seats are limited and special arrangements and equipment must be confirmed. Consider the off or cusp seasons - Everyone wants to cycle in Provence during September or go diving in the Cayman Islands in March. Traveling slightly before or after the most popular seasons gives you much of the same experience at less cost. Use a Travel Agent - Again, a good travel agent can save you time and money. She can be on the look out for deals on adventure travel as soon as they are announced, giving you a jump on most other travelers.